Kelly Tolhurst Member of Parliament for Rochester & Strood visited the IPS Workshop at Northbank House on Friday the 20th April and congratulated apprentices on their recent apprenticeship achievements. 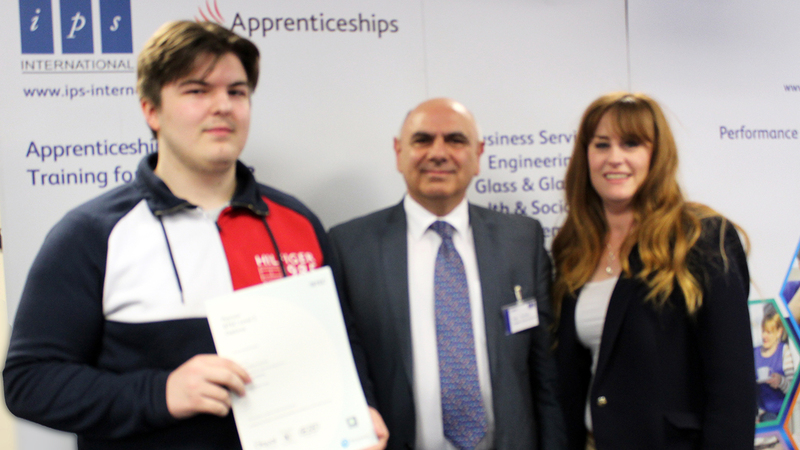 Engineering Apprentice Dan Eydman with employer Jon Marks – Z-Tech and Kelly Tolhurst MP. Firstly, Kelly met Dan Eydman who has recently completed his Advanced level 3 Apprenticeship in Engineering Maintenance / Construction Plant and Systems – Instrument and Controls. 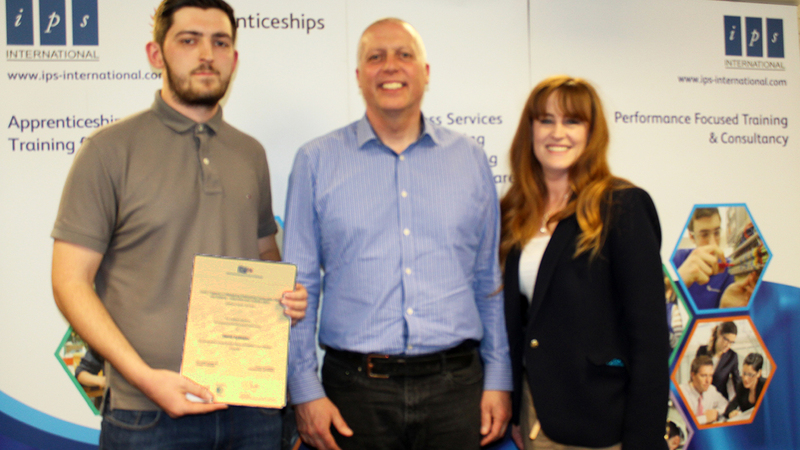 Kelly presented Dan with his certificate alongside his employer Z-Tech Control Systems and Dan’s IPS assessor, Richard Thompson who were there in support of Dan’s achievements. Next to meet Kelly was Lewis Rigden who has recently completed his Intermediate L2 Business Administration Apprenticeship with IPS, Lewis was also presented with his functional skills ICT certificate that he passed with IPS. Lewis told Kelly how he started his Apprenticeship because he felt it would be the quickest way for him to learn a trade while earning a wage and it gave him a good understanding and insight into a working environment. Apprentice Lewis Rigden with his employer, Brian Simpson Service and Operations Director at Windows for Construction Ltd and Kelly Tolhurst MP. Lewis was in attendance with his Employer Windows for Construction where he is now in full-time employment and he told Kelly how he is hoping to progress and develop with them further. Finally, Kelly congratulated Kayleigh Proctor; who recently completed a L3 Business Administration apprenticeship. 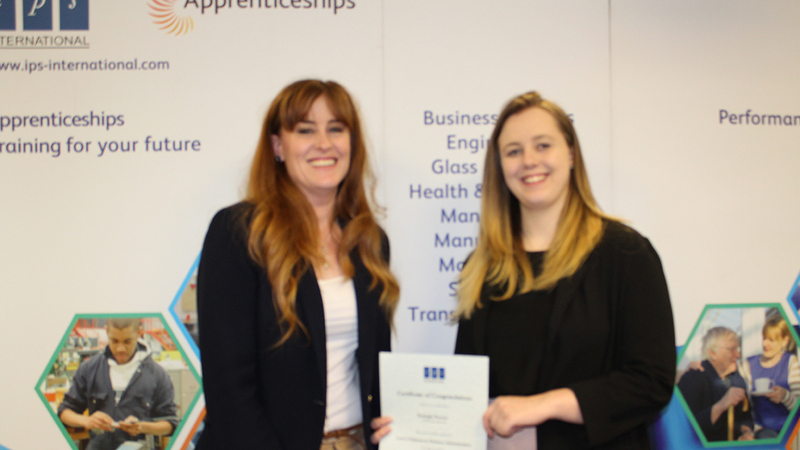 Kayleigh is now a Business Administrator working for IPS International Ltd.
Kayleigh Proctor, IPS Business Admin Apprentice, being presented her certificate by Kelly Tolhurst MP. 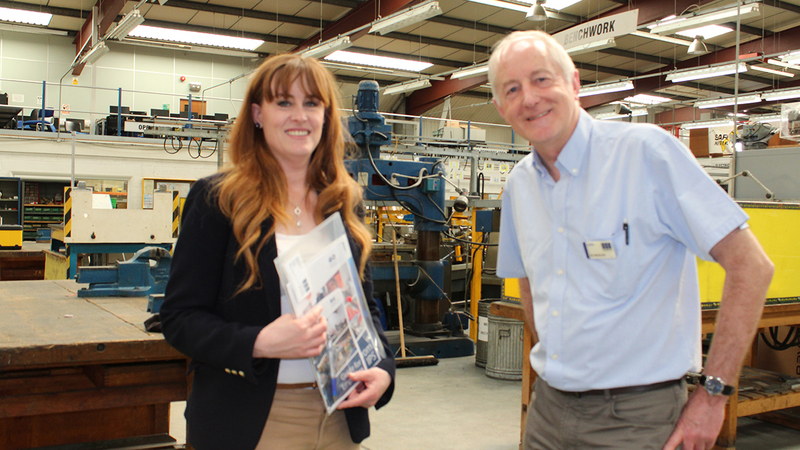 While visiting Northbank House, Kelly also took a tour of the IPS workshop with Director Don MacDonald. Kelly has an extensive engineering background and was very impressed with the workshop, and the different variety of sectors it caters for; Electrical, Milling, Welding, Benchwork, Motor Vehicles, Hydraulics to name just a few. Kelly especially enjoyed the Hydraulics section as she has trained in this field and even mentioned she wished she had known about IPS when she was in training as she couldn’t find anywhere more local to her other than Greenwich at the time. Kelly Tolhurst MP and IPS Director Don MacDonald in the IPS Workshop. 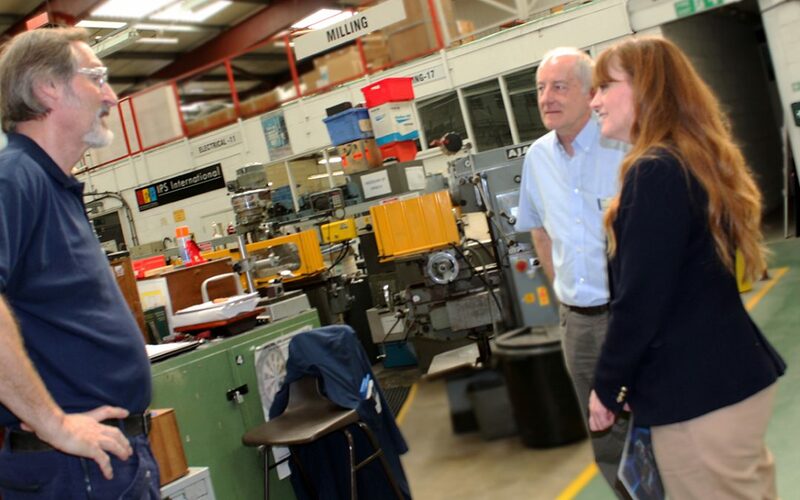 To celebrate and encourage more local skilled young people to take up an Apprenticeship, Kelly Tolhurst MP, will be hosting an Apprenticeship Fair on Friday 4th May 2018, 10 am to 2 pm at the Medway University Technical College. IPS will be attending and supporting, giving you information and guidance on Apprenticeships. We would like to thank Kelly for taking the time to visit us, and we look forward to seeing you again at the UTC event next week. Kick start your career with an Apprenticeship today?